Zimbabwe comeback not enough as Windies set up pivotal last round of matches. The Windies averted disaster and swung the Cricket World Cup Qualifier back their way after chasing down Zimbabwe’s 289 in a tense Super Six game at Harare Sports Club. After Brendan Taylor’s superb 138 had guided the hosts to a strong total, West Indies put together a succession of telling partnerships to secure victory despite Zimbabwe threatening yet another dramatic comeback. So the Windies take one step closer to #CWC19 while Zimbabwe's quest will come down to their final match. Chris Gayle got things off to a brisk start by striking consecutive sixes off Sikandar Raza in a breezy 13-ball 18. Zimbabwe were delighted to get him early – caught at third man off Blessing Muzarabani (2/36) – but they would have to wait a while longer for any further breakthroughs. Evin Lewis batted well alongside No.3 Shai Hope to compile 64 – including seven fours and a six – before departing caught and bowled to Raza in the 22nd over. Hope and Player of the Match Marlon Samuels then set about putting the Windies in charge, milking the Zimbabwe attack and gradually accelerating to get their team within striking distance of the total at 245/2. Samuels was furious with himself for falling caught behind to a Muzarabani slower ball in the 44th over for 86, and he might have been even more upset had he known the collapse that would ensue. Hope was out just five balls later for 76, to a brilliant catch in the deep by Raza off the left-arm spin of Sean Williams. 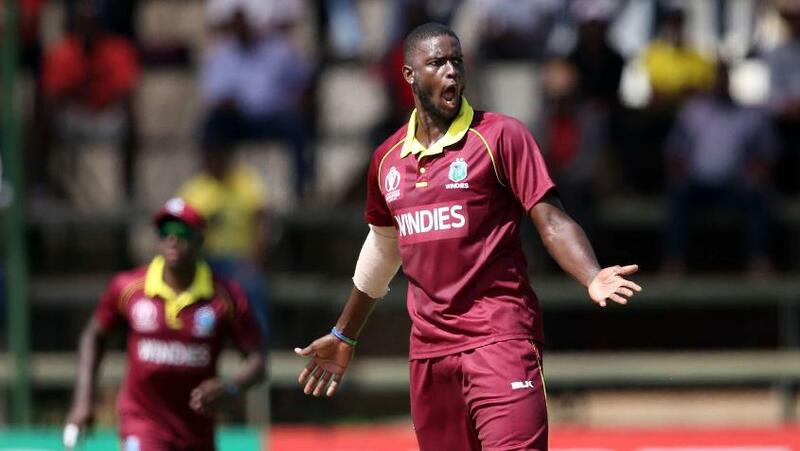 Now it was 249/4 in the 45th with two new batsmen at the crease, both of whom – Shimron Hetmyer (13) and Jason Holder (6) – were out in the 46th to leave the WIndies 265/6. Zimbabwe had taken four wickets in three overs while Windies – with Hetmyer having come out all guns blazing – had put on 22 runs. With the crowd a-buzz and sensing yet another comeback win from Zimbabwe, it took cool heads and cautious batting from Rovman Powell (15*) and Ashley Nurse (8*) to see their team over the line in the end. The pair picked up 10 singles, a two, two boundaries and two extras to reach the 21 required from the last four overs, which was achieved with an over to spare. While a win for Zimbabwe would have confirmed their spot in the 2019 World Cup in England and Wales, the result put the Windies top of the table and means both sides require wins in their final Super Six matches to guarantee their qualification for the tournament. Earlier, Taylor's ninth ODI century had led Zimbabwe to a strong total of 289. After winning the toss and batting first, Zimbabwe were dealt an early blow when hard-hitting opening batsman Cephas Zhuwao was caught by Keemo Paul off Jason Holder for a duck in the second over with just two runs on the board. Hamilton Masakadza and Solomon Mire added 26 runs for the second wicket before Holder struck again, this time sending Masakadza back caught by wicket-keeper Shai Hope. It got worse for Zimbabwe when, only three balls after Masakadza had been dismissed, Mire was hit in the helmet by a Kemar Roach bouncer. The ball beat Mire’s pull and lodged between the peak and the grille of his helmet, and after consulting with the team physio, the batsman decided to walk off. He was on 22 at that stage. The injury wasn't as serious as initially thought, though, as Mire managed to come out and continue batting later in the innings, after the fall of the fifth wicket in the 43rd over. Mire's departure brought Craig Ervine to the crease, and he added 49 runs with Taylor to revive the Zimbabwe innings, but it was after Ervine was bowled by Roach in the 20th over that Taylor took the mantle upon himself to up the ante and change the course of the game. He brought up his 32nd half-century off 65 balls in the 27th over, and added 76 runs for the fourth wicket with Williams, who completed 3,000 one-day international runs during the course of his knock of 34 from 31 balls, which ended when he was caught at short mid-wicket by Nurse off Paul. Taylor was unfazed by the loss of his partner, and continued the onslaught, and went past the three-figure mark – for the second time in the tournament – when he reverse swept Gayle for four in the 38th over. He celebrated by taking on Devendra Bishoo, hitting him for three consecutive boundaries – a six and two fours – in the 40th over. Raza, who has been one of Zimbabwe’s stars in the qualifiers, didn’t have one of his better days, scoring a 33-ball 22, and Mire came back to raucous cheers from the crowd at the fall of Raza’s wicket, to Holder. Taylor had motored on past 130 by then and looked good for more when he miscued one off Roach for Nurse to take a well-judged catch at short cover. His 138 came off 120 balls with 20 fours and two sixes. Mire batted on till the penultimate over with the Zimbabwe tail and took the total past 280 before he was bowled by Holder for 45, scored off 33 balls with three fours and two sixes. The Windies captain returned figures of 4/35 while Roach picked up 3/55 and Paul had 2/55 as Zimbabwe were bowled out off the last ball of their 50 overs.